Teaching the ABYSS young scientists to promote and communicate on science and research towards the general public and policy makers is an essential part of the ABYSS Initial Training Network. The ABYSS trainees are expected to actively participate in the outreach activities organized within the framework of the project and to use other dissemination channels such as press releases, peer-reviewed articles or presentations given at conferences and workshops. The main two practical outreach activities organized specifically as part of the ABYSS outreach programme include the participation of the ABYSS trainees to “La Fête de la Science”, an event organized every year by the French Ministry of Research to promote and communicate on science and research, and the setting up of the SeaRocks Blog, a student driven project in which the trainees present, post and discuss their own project, general deep sea research and events of interest for them. After a first scientific outreach training in Montpellier and several meetings to prepare the SeaRocks blog and the “Fête de la Science”, the fellows benefited from a new training by Merience Strategic Thinking about how to communicate on the impact of science on society and vice versa at IPGP on October 13, 2015. The objective was to discuss a case that can occur in scientists’ careers: some of their projects and/or the most recent research discoveries can have direct impacts on everyday life and can be considered as harmful to the environment and to the society. Scientists must therefore be prepared to communicate and to provide legible information to citizens so as to restore trust. Several ways of communicating about the impact of research work were presented during this outreach meeting in order to help the trainees to face this kind of situation and to react in an appropriate manner in case of conflict. A conflicting situation was chosen as an example: an NGO issues an alert on a repository project for low and intermediate level radioactive waste. The trainees were divided into 2 groups: the first group was the scientific advisory board of the radioactive waste management agency and was in charge of explaining the project, its risks and safety measures undertaken by the agency ; the second group represented the environmental groups and concerned citizens that challenged the project and the integrity of the scientific advisory board. Each group used a communication plan and a list of arguments and experienced the importance of a targeted communication when dealing with sensitive issues. The exercise emphasize the difficulty and importance of keeping scientific integrity during a heated debate. 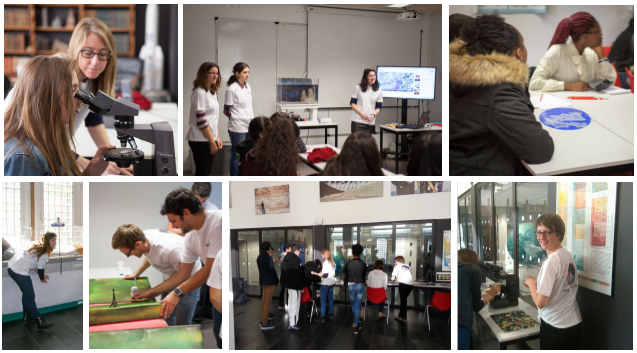 At the occasion of the French “Fête de la Science”, the ABYSS trainees organized an outreach event entitled “Géologie des Abysses” at IPGP on October 9, 2015. Students from three high schools – Lycée Henri Bergson (Paris), Lycée Flora Tristan (Noisy-le-Grand) and Lycée Suger (Saint-Denis) – benefited from 3 different workshops related to the scientific topics investigated within the network, prepared and animated by the ABYSS fellows: Ocean drilling, Draw me a volcano and Geodynamics. After several outreach training meetings provided by Meritxell Martell and Bénédicte Ménez, the ABYSS trainees designed their blog and defined its editorial lines. This blog about the oceanic crust is self-managed by the fellows. The posts are supervised by a moderating board composed of 3 ABYSS seniors scientists. The official launch of the SeaRocks Blog was held at IPGP, Paris at the occasion of the “Fête de la Science” on October 9, 2015. Participants to the Fête de la Science were invited to sustain an exchange with the trainees by following them on the SeaRocks Blog but also on Twitter and Facebook. How to communicate about science ? On November 23, 2014 in Montpellier, the ABYSS trainees benefited from a first outreach training provided by Merience Strategic Thinking on how to communicate about science. The meeting started with a “science-high-speed-dating”: two minutes for both “daters” to present their background and project. It allowed the newly recruited fellows to get a first idea about what everybody is working on. This first funny exercise broke the ice and helped to connect faces, names and projects. The rest of the meeting was dedicated to communication about science (different forms of dissemination and storytelling) and to discuss the ABYSS outreach activities which includes developing a blog and the preparation of an outreach event at the occasion of the “Fête de la Science”.